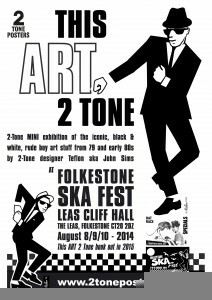 An added feature for ticket holders to Folkestone Ska Fest, August 8, 9 and 10 in Leas Cliff Hall will be a showing of the mini “This ART 2 Tone” exhibition. Some of the iconic 2 Tone graphics designed by TEFLON aka John Sims back in the day and more… DON’T MISS! You are currently browsing the classic 2-tone graphics news archives for July, 2014.